The whole of Singapore was rooting for Nathan Hartono through his journey on Sing! China in 2016, which he emerged as the runner-up in the finals. Hartono was already a media darling with his charming disposition and magnetic voice before that, but the singing competition catapulted him into national hero status. Shortly after, his face started appearing on the packaging of Singapore’s favourite chocolate malt beverage, Milo, and an onslaught of endorsement deals followed. Thanks to the singing competition, Hartono’s talent is finally embraced by a wider audience, but his musical career really began in 2005. Despite the ebb and flow of the fickle entertainment industry, he honed his craft through his laser-focus and grit. Hartono has done it all, from performing at intimate settings and world-class stages to acting in local productions and regional TV shows. This month, he will be making his leading role debut in the romantic-comedy movie, When Ghost Meets Zombie. If one were to get the opportunity to witness Hartono in action, they would notice that he truly gets in the zone. For this cover shoot, the Men’s Folio team wanted to discover a different side to Hartono’s wholesome demeanour, so we envisioned a gritty Hartono in the vein of rebellious intellects from the Beat Generation. When he got on set, he took the brief and got ready for the shoot. Everyone present could feel he was entirely present and ready to give his best. In fact, the team often wanted to encourage Hartono during the shoot, but the words bounced right off as he was so engrossed in his role. That is Hartono’s tenacity at work, which he probably displays in every aspect of his life to bear fruits of success in everything he does. Coming off Sing! 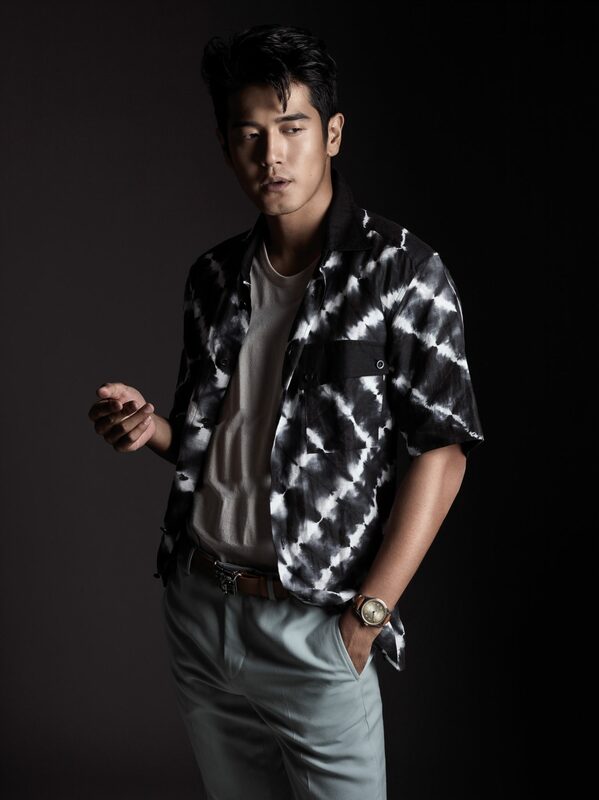 China, Hartono has involved himself in many projects, to the extent of giving up a role in the phenomenal blockbuster, Crazy Rich Asians (“it wasn’t a huge role, not Henry Golding’s!”), but he shares in this intimate interview that music will always be his first love. I would say it treated me pretty well. It was definitely not the year that I expected. I expected to spend a lot more time in China, and I expected to really dig in into that whole scene and do a lot more there. Because of random delays, scheduling, and a lot of unforeseen circumstances, that didn’t happen. At first, it was quite upsetting, disappointing, and disheartening, because around the June/July period, I was like, “Oh man, I haven’t done so much I wanted to do this year.” But, as the months went by, it gave me a different perspective on what I want to do, how I want to do it, and the music I want to make. It’s a matter of realising that everything has its own time and I can’t really will it into existence as much I want to make that happen. The best I can do is really to give my best hustle, and if it doesn’t happen, figure out how I can take that as the learning process and not feel defeated. I became a lot closer to the people around me, and I opened up a lot more. It’s almost because the career took a slight backseat so I could grow personally. There has been a marked evolution from when you debuted with jazz in 2005. I think it just happened, like no one can do one form of music for a very long time. Jazz just happened to be the genre of music that spoke the most to me at the time when I started, the music that I felt I related to the most. What is acting to you as a musician? When I get acting opportunities, I get excited. At this point, I don’t know if I should because I don’t know if I’m good at it. I know the reason I’m getting these roles is that I’m a popular public figure, and people want to see me. However, it also opened me up a lot and just made me appreciate the aspect of performance a lot more. That’s why I always go back to it, even though I have my doubts about how good I am or whether I should be doing it. I know it makes me dig into a different part of me that perhaps songwriting and working in a studio definitely do not. Any new influences on your music? The ones that I go back to the most are Chance the Rapper, Kendrick Lamar, Ed Sheeran, and old Kanye West. Catch the full interview in our February’19 issue, out on newsstands now.